You who know that you were born to assist as spiritual midwives in this evolutionary shift into the Age of Aquarius and unity consciousness have been called to many sacred sites. It is an important time to come together in Love, Unity, Song, Prayer and Ceremony. 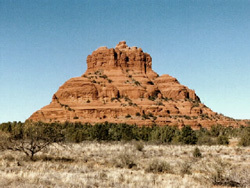 At the Gathering of the Ancestors in Sedona in April, 2009, the Mayan Elders communicated that between May 2010 and 2012 is the time of the Great Shift. each will receive a discount of $200 per person. 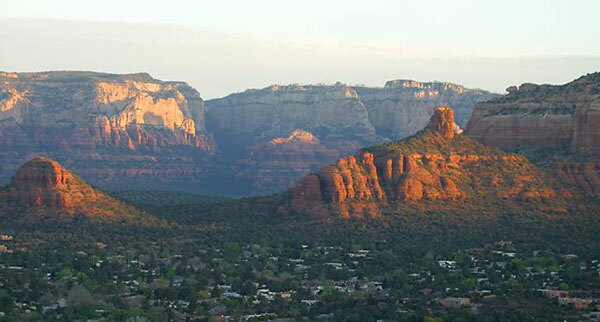 A self-questing pilgrimage to connect with the spectacular Red Rock cathedrals, naturally formed and impregnated with the ancestral spirits and guardians of Sedona’s beautiful southwestern USA desert landscape. Sedona has been a place of ceremony and vision; a spiritual land to ancient peoples and native tribes for many thousands of years. The enchanting land is the shaman and the teacher. We join with their love, song and prayers which frees the soul to spread its wings and fly. Walking in the pathways between inner and outer worlds, we come to understand the meaning and message of the four directions of the medicine wheel teachings. Entering the many and diverse vortex power spots is an awe-inspiring journey; we do this ceremonially, using drum, song and creative expression. This is a special time to nourish yourself, express your deepest intentions, listen to your heartsong and be supported on your personal earth walk. 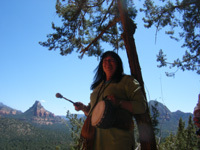 You will meet Sedona's special Earthkeepers, artists, and musicians. The journey is limited to 12 people and will be a unique, healing and meaningful shamanic pilgrimage under the crystal clear blue sky, the clean air and the magnificence of the brilliant stars seen in the milky way at night. 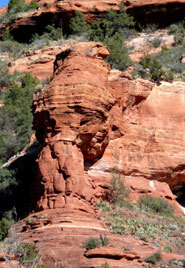 It is no wonder that Sedona, Arizona was voted “The most beautiful spot in the USA.”. It was while spending the summers of the early 1960’s in Sedona, that Elizabeth first experienced an awakening into her spiritual and tribal roots. 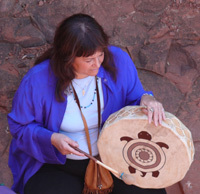 When she returned to Sedona in 1987 for the Harmonic Convergence celebration, she knew the ancestors of the land were calling her home. She feels now is an important astrological time shift. She will present this to those called to Sedona, her home since 1990. We will experience the depth of beauty, power and healing that is available in this very sacred place. Elizabeth has been guiding self-questing journeys to Mystical England to Re-awaken the Heart of Avalon’s Holy Grail since 1993. She has discovered, along with many others, that there is a spiritual highway, a rainbow bridge connecting these 2 powerful spiritual centers on our beloved Earth. The rich iron Red of Sedona and the healing Green of Glastonbury, ancient Isle of Avalon are sacred centres where the veil between the worlds is thin and where we can easily gain access to spiritual dimensions, the holy grail within, bringing healing, meaning and purpose into our lives, to be of service to humanity. First woman, Komwidpokuwia, old stone woman, originally came from Montezuma’s well, where the Yavapai had been living before the great floods came. She was placed inside a hollow log, along with a dove and some food. Then they sealed the log with pitch so she would float safely to a new place of safety to create the next world. It is said that she landed in Boynton Canyon, where she lived in a cave. “She is the Goddess of the supernatural and medicine powers and is beautiful and as pure as a down white feather. The medicine men or anyone believing may see her In a vision or dream and receive instructions comfort and encouragement.” Nicholas Mann, British geomancer and author in his magnificent book “Sedona’s Sacred Earth", discovered this legend of the Yavapai from stories he compiled from E. W. Gifford in 1932-1936.Two Yavapai elders in the 1800's shared their legends with Gifford. 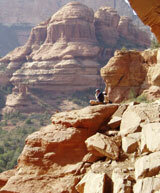 Nicholas' book is the best on the sacred geomancy and energies of Sedona, as well as about the Isle of Avalon. HIs books are a must-read ! 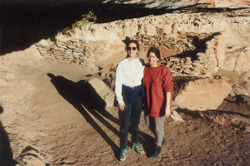 If you would like a personal pilgrimage or to host a group of 6-12 people together for a sacred journey to Sedona, AZ, Southwest England and/or Scotland during the year, Elizabeth would be happy to be your guide. Just contact me with your specific dates and desires and we will manifest a special pilgrimage together. Ongoing tours are available March - May and September - November. 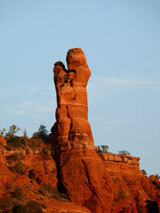 this is the best time to come to Sedona. • Private coach to and from Phoenix Sky Harbor Airport and all other ground transportation. When we receive your deposit, we will send flight and other important information to you. *The price is based on US Dollar amounts with a minimum of 8 people. Rates in other currencies may vary due to fluctuating exchange rates. - Please only bring one small piece of luggage and a carry-on. You will be responsible for carrying these, so make sure you can handle them. - Comfortable walking shoes and layered clothing. A deposit of $450 is due now to secure your place on the pilgrimage. The first payment and final paymenf of $1100 must be paid on or before the due date posted. Cancellation Policy: The deposit is non-refundable. Cancellations made 60 days prior to departure will receive 50% of the amount paid, not including the $450 non-refundable deposit. No refunds will be made on later cancellations. A deposit of $450 is due now to hold your space. When deposit is made please fill out the contat form here.